The 1993 class of Zephyrhills High School went out with a bang—not to mention a few “barks”—in graduation ceremonies held in the school’s activities center last Friday night. The 272 seniors and 65 honor grads were the limelight for 9- excitement-filled minutes as moods swung from reflective to raucous with the blink of an eye. Excitement began to build as organist Joseph Olichney led the honored Bulldogs into the arena with the “Pomp and Circumstance” processional march. Seniors, parents and families took their seats and basked in the culmination of 12 years of toil, trials and tests. To demonstrate this, Wooten presented the “visual showcase of a few of our memories,” including shots of the Powder Puff game to science labs. Shouts, cheers, laughter and signs emanated from the graduates in a cacophony of emotions as the slides slipped by one-by-one. Class President Rhonda Smith followed with the Address to the Senior Class. She focused on the value of high school memories, whether good, disappointing, exciting or embarrassing. “No matter what kind of memory it was, it was still a memory," said Smith. It took may special ingredients to make all those memories—sugar and spice, time along, laughter, tears, and most importantly a good friend. That good friend was always there, through the good and bad times, with a hug or a smile. Most important, she said, is to make sure the ones you love—the ones you shared the fondest memories with—know how you feel. She quoted a Garth Brooks hit, “If Tomorrow Never Comes,” to make her case. “Tell someone you love just what you’re thinking of, if tomorrow never comes,” she recited, quoting the last bars of Brook’s song. “Time and space may separate us, but wherever our pathways lead us, we will always be the class of 1993 of Zephyrhills High School,” she added. 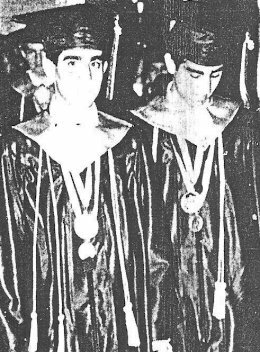 Then came the twins, Monu Bedi and Sonu Bedi, co-valedictorians of 1993. The pair shared speaking duties, volleying back and forth table-tennis style, but with a bit of irony they emphasized the importance of individuality, conviction and beliefs. The address began with a mock-debate over who should give the speech, ending with the twins agreeing to share the duties. “I wanted to give the speech,” one rang out. “I had the higher SAT score and I’m older,” came the argument. “But I’m stronger…” came the rebuttal. Normally, they conceded, each twin battles for the last word. The compromise was a rare one, they said, evidence of their desire to excel and succeed—the same desire that led each senior to the same place that graduation night. The choice to compromise was a wise one; the insightful Bedi's had the audience hanging on their every word. “We each hold in us different views and beliefs,” the speech began. “It is important we never compromise what we feel in our heart to be true—It is important not to deny those beliefs. Once seniors leave high school, said the Bedi’s, they are left with their beliefs as their “own best friends,” and are left with only their own “personal power” to make important decisions. Then came the presentation of the Senior Class Awards, the time for real excitement to build before the awarding of diplomas. Monu Bedi, David Husted, and Kristin Ezick received Merit Awards; Mia Bice and Brad Burks took Citizenship Award; Rhonda Smith and Sonu Bedi were presented the Leadership Awards and Jennifer Wooten and Daniel Husted were honored with Best All-Around Awards. The Class of 1993 at Zephyrhills High will go down as one of the largest and most successful in school history. The 272 departing seniors are the most students ever to leave at he same time and 65 honors graduates also represent a school record. Those record numbers are not without their rewards. The students earned nearly $900,000 in scholarships this year, a $400,000 increase from last year. What’s more, an extensive list of students is doing more than just staying in school; they’re bringing out the best of their abilities in the classroom. Teachers, counselors and administrators are in agreement that good grades rub off. Apparently so does attendance. …There was also no shortage of students participating in extracurricular activities this year. Feely believes youngsters who join a club or play a sport get more out of school. “Kids that are involved in extracurricular activities, as a whole, have a higher grade point average than kids who are not involved,” he said. Joining their classmates in an activity, spending more time with adults who can push them and simply being at school more are all favorable aspects of extracurricular activities. The following lists reflect the top academic students of the graduating class. The National Honor Society, which mandates a student carry a 3.2 GPA or better, includes 65 seniors. They are: Kvorak Adanas, Mia Bice, Gerald Bliss, Karla Brown, Molly Brown, Stephanie Brown, Valynnda Castells, Ginger Davidson, Shannon Davis, Karen Kistasi, Courtney Daughtery, Kristin Ezick, Krista Florer, Jennifer Hale, Patricia Hall, Nils Hallberg, Sabrina Haynes, Emily Henson, Dien Hoana, Angela Mason, Stephanie Massey, Kara Mathis, Angela McQueen, Mary Moncrief, Brenda Montenegro, David Nash, Erin O’Neil, Brian Overstreet, Kim Peabody, Heather Pickard, Joshua Prickett, David Rhodes, Jeffrey Richards, Cathy Riley, Deanna Roper, Dana Scarbrough, Carrie Schuster, Amy Shirley, Rhonda Smith, Diogo Taviera, Carla TenBrink, Timothy Tyler, Ken Uryu, Rustin Waller, and Krista Wood. Also on the list are 18 students who graded out at 4.0 or better. The include: co-valedictorians Monu Bedi and Sonu Bedi; Salutatorian: Jennifer Wooten and Joseph Baker, Arthur Carlson, Joanne Fordiana, Kim Goodwin, Tesa Hale, Daniel Husted, David Husted, Lori Johnson-Munn, Areti Karakatsanis, Jill Lillibridge, Barbara Lyons, Mark Roberts, Christian Santos, Makenzie White and Alicia Wolfe. Also 11 seniors received perfect attendance certificates: Kristin Ezick, Mandy Good, Robert Pullo, Shilpa Patel, Travis Sanders, Joseph Baker, Monu Bedi, Krista Florer, Brenda Montengro, Doug Pence and Emily Pepperman did not miss a day in their final year of high school. Zephyrhills High football coach Tom Fisher spotted a reporter Monday evening and asked if he had called earlier in the day. "Did you call me to find out if we were going to a bowl game?" Fisher said. "Well, nix that." And nix Hernando and Pasco from the state football playoffs. Zephyrhills defeated Hernando 7-0 Monday in a Kansas tiebreaker to win the Class 3A, District 7 shootout for second place and a trip to Osceola Friday for the first round of the state playoffs. Hernando edged Pasco 8-6 in the first tiebreaker. "After going 0-10 last year and then doing this - you have to credit the kids," Fisher said. "They worked hard and did everything we asked of them, and this is the result." The shootout was necessary because the Florida High School Activities Association expanded the playoffs this year to include the second-place team from each district. Zephyrhills, Hernando and Pasco tied for second at 3-2 in 3A-7 behind district champion Land O’ Lakes (5-0). The teams elected to use the Kansas tiebreaker, in which possession is alternated from the 10-yard line until one team has the scoring advantage. Pasco (5-5) and Hernando (4-6) played first, and Zephyrhills (7-3) had the bye based on better overall record. After surviving the first shootout, Hernando won the toss and deferred possession. It took the Bulldogs just two plays to score. After Mike Smith's 3-yard run to the 7, quarterback Donnie Pinkerton dropped back to pass. Pinkerton looked off his two primary targets to his left and found tight end Scott Cherry all alone in the middle of the end zone. It was Cherry's first catch this season. "We worked on that play all week in practice," Cherry said. "I lined up on the right and then just dragged across the middle. Donnie put the ball right there." Said Pinkerton: "My primary receivers were covered and I knew Scott would be there. I had all the confidence in him." The Bulldogs added the extra point from 25 yards out as Tom Hutchinson's kick was good after a delay penalty. Now it was time for the Bulldogs defense to shine. The Leopards gained an advantage when Zephyrhills was called for being off-side on the first play. So Hernando started from the 5 and on its first play, Matt Deason, who scored on a 10-yard run against Pasco, was stopped for no gain On second down, quarterback Shad Reese fumbled a pitchout and the ball bounced on the ground for the taking. Reese jumped on it at the 5 and Hernando was still in business. Again, Reese pitched poorly to the left and Deason caught the ball on the bounce and fell on it for a 2-yard loss. On fourth down from the 7, Reese tried to hit Rodney Addison on a flair pass but it fell short, and victory belonged to the Bulldogs. "We knew they had a habit of fumbling and I'm glad they did it twice tonight," Fisher said. "But our defense was pressuring them." Hernando coach Mike Imhoff acknowledged that. "We just didn't play ball," he said. "We got all sorts of pressure in our face. "The best team won and that's what's supposed to happen," Imhoff added. In the first tiebreaker, both teams scored touchdowns on the first play, but Addison's 1-yard conversion run after a penalty was the difference. Hernando's Deason took an option pitch from Reese and ran untouched to the left corner of the end zone. After Addison's run, it was 8-0. Pasco answered on the next play when Page Sessoms, lining up in the left slot, took a pitch from Charles Harrison and strolled around right end and into the end zone. Pasco tried the same play on the conversion and Sessoms was stuffed at the 5. "Page walked in the first time and it would have been crazy not to try it again," said Pasco coach Perry Brown, who was missing 1,000-yard rusher Troy Hambrick to an ankle injury. "But that's the way it goes," Brown said. "Four downs and your season is over. I still don't like this tiebreaker." Several area coaches watched Monday's event, including Osceola's George Palmer. The Pinellas school will play host to Zephyrhills Friday at 7:30 p.m.
"There's not much we could get out of watching them tonight," said Palmer, whose team is 10-0 and is the 3A-6 champ. "We know they can pass and they had a great defensive stand tonight. "But we're a pretty good football team too. We're looking forward to playing a small-town team. They should have quite a following." And it is a following headed to the playoffs, not a bowl game. "It works for me," Fisher said. Mia Lee Bice, Brandi Renee Pattie and David Nash are winners of the Zephyrhills Civitan Club's annual Uncle Sam Awards. The awards are presented each July to three youths who have demonstrated outstanding citizenship in their community and school. Local youths are nominated for the honor and the top three are selected by the Plant City Civitan Club. Mia Lee Bice is a graduate of Zephyrhills High School where she maintained a 4.0 grade point average her senior year. She was a member of the National Honor Society, Student Council, the Encore choir and Pride. Pride teaches people how to have fun without drugs or alcohol. She also is active in her church choir and hand bell choir. She was a winner in the Americanism Essay Contest sponsored by the Elks Lodge of Zephyrhills and the Florida State History Fair essay contest. Her fair essay is titled, Down and Dirty: Claude Pepper vs. George Smathers. Florida's 1950 Primary Race for the United States Senate. Bice received the James A. Chappie Most Promising Teacher Scholarship and will study at the University of Florida. She eventually wants to be an administrator in a Florida high school. Brandi Renee Pattie was crowned Miss Zephyrhills 1993 in February. She has had perfect attendance each year at Zephyrhills High School where she is active in golf, soccer, volleyball and basketball. She is involved in Teens for Christ, Interact, Fellowship of Christian Athletes and Junior ROTC and served on this year's prom committee. She has awards for baton twirling and awards from the Red Cross for life-saving techniques. For the talent portion of the Miss Zephyrhills pageant she clogged. She is active at First Methodist Church. David Nash, a graduate of Zephyrhills High School, is one of 250 students nationwide to attend the Summer Scientific Seminar at the Air Force Academy in Colorado Springs, Colo. He was a member of the National Honor Society and captain of the Brain Bowl Team. He attends First Baptist Church of Zephyrhills and manages the church sound system for various services. He received a scholarship from the East Pasco Board of Realtors. Each winner received a savings bond and a trophy. Others were great accomplishments that seemed more like disappointments to their participants. Zephyrhills High golfer Erin O'Neil, a top national junior’s player, again finished a disappointing second at the high school state tournament. In May, Zephyrhills High junior Erin O'Neil watched a high school state championship slip by and finished second for the second straight year. She'll have one more chance as a senior. O'Neil took advantage of the NCAA's early signing period to sign a letter of intent in November with the University of Georgia, which has the nation's second-ranked Division I women's golf program. Zephyrhills baseball product Dave Eiland (1984 Graduate of ZHS) was dropped by the New York Yankees roster in January. Faced with returning to the minors if he stayed in New York, the pitcher berated the Yanks, but changed his tune a week later and said he'd probably rejoin New York. He did another flop and signed with the San Diego Padres' AAA affiliate a week later. Eiland moved up to the Padres and had his first major-league at-bat in April - and hit a two-run homer, the first pitcher to homer in his first major-league at-bat since Jose Sosa in July 1975. Dade City's own Jim Courier became the No. 1-ranked tennis player in the world after winning the Australian Open in January. Courier lost the ranking in March to Stefan Edberg, but regained it in April and followed by winning the French Open for the second straight time. Pride award winners were, in mathematics, Monu Bedi, Zephyrhills High School; science, Elizabeth Alas, Ridgewood High School; social studies, Jeffrey Scott Powers, Ridgewood High School; writing, Trisha Lynn Schmirler, Pasco Comprehensive High School. Winners of the Hugh O'Brien Youth Foundation Awards were Frank Lupo, Land O’ Lakes High School; Thomas Hutchinson, Zephyrhills High School; Khristina Thomas, River Ridge High School; Beatrice Lee, Pasco Comprehensive High School; Rebecca Hansen, Gulf High School; Virginia Lees, Hudson High School; Allyson Schneider, Ridgewood High School. This week's Top of the Class page presents the names of those middle and high school students who really are "top of the class." The list, supplied by the school district, is of straight-A honor roll students for the first quarter, which ended in November. From Zephyrhills High School: Joseph W. Baker, Monu S. Bedi, Sonu S. Bedi, Callie S. Booth, Shelly L. Brownsberger, Bradley Burks, Teri A. Butterfield, Charley Demosthenous, Mandeep S. Dhalla, Ann J. Dobbins, Courtney A. Dougherty, Joshua D. Fife, Jade S. Green, Robert L. Hecksher, Robert B. Holt, Daniel S. Husted, David S. Husted, Victoria L. Jeannette, Areti O. Karakatsanis, Hariharan Krishnaraj, Kaname K. Kuniyuk, Yukio A. Kuniyuki, Jillian L. Lillibridge, Barbra P. Lyons, Steven Lyons, Stephen P. McLeod, Jamal G. Misleh, Matthew J. Mohler, Richard L. Moore, Paula S. Neale, Kimberly Peabody, Eileen N. Phethean, Mark L. Roberts, Chut Sombutmai, Michelle L. Thomas, Deborah E. Thompson, Alicia R. Wolfe, Kimberly A. Wood, and Jennifer A. Wooten. …….Note: As of Summer, 2007, Sonu Bedi is an Assistant Professor at Yale and teaches course entitled, The Supreme Court and Constitutional Development and Civil Liberties and Individual Rights in the United States with the following degrees: M.A., M. Phil, Ph.D., Yale University; J.D., Harvard Law School; A.B., A.M., Brown University. Political Contingency: Studying the Unexpected, the Accidental, and the Unforeseen, edited with Ian Shapiro, NYU Press, forthcoming. "What is so Special About Religion? The Dilemma of the Religious Exemption," Journal of Political Philosophy, forthcoming, Vol. 15, 2007. "The Law's Treatment of Stealing Breach and Negligence: Why are Crimes Special?" Criminal Law and Philosophy, under review. "Repudiating Moral Legislation: Rendering the Constitutional Right to Privacy Obsolete," Cleveland State Law Review, 53(3), 2006. Monu Bedi is also a graduate of Harvard Law School and Dartmouth College. He was a Navy JAG attorney and as of 2007, is practicing law in New York City. The following students were named winners of the National Merit Scholarship Awards and were honored at a recent School Board meeting: Satish Tiyyagura, Hudson High School; Trisha Lynn Schmirler, Pasco Comprehensive High School; Kathryn Claire Warfel, Pasco Comprehensive High School; Elizabeth Alas, Ridgewood High School; Mary Parkin, Ridgewood High School; Jeffrey Powers, Ridgewood High School; Susan Mary Dacy; River Ridge High School; Rajani Venkata Dinavahani, River Ridge High School; Daniel Curtis McCoy, River Ridge High School; Mathew John D'Amico, River Ridge High School; Brian Nelson Dobbins; River Ridge High School; and David Shakespeare Husted, Zephyrhills High School. The following students are winners of the Outstanding Student Award and were honored at a recent School Board meeting: Kostandinos Stubos, Gulf High School; Kerry Murray, Hudson High School; Alexandria Rivera, Land O’ Lakes High School; Sarah Graves, Pasco Comprehensive High School; Elizabeth Ann Alas, Ridgewood High School; Susan Dacy, River Ridge High School; and Erin O'Neill, Zephyrhills High School. Miami area public schools may be afraid to face the nation's top-rated high school baseball team, but two schools from the North Suncoast are more than willing. And more than honored. Miami-Westminster Christian, 1992's mythical national champion and the top-rated team this year according to USA Today and Baseball America, will take on Hernando High today at 7 p.m. and Zephyrhills on Saturday at 1 p.m.
"This has created a lot of excitement in Zephyrhills," said Bulldogs coach Craig Milburn. "There's no doubt we are stepping out of our league somewhat, but it is quite an honor to play the best team in the nation." While Zephyrhills is thankful for the opportunity, most schools in Miami avoid Westminster, said Warriors coach Rich Hoffman. "There's not a lot of people who want to play them," Hernando coach Ernie Chatman said. Westminster is a private school located in South Dade, the area devastated by Hurricane Andrew, and the highly successful baseball program acts as a magnet to attract the best players in the area. Westminster won the Class 2A state title last season, its third championship in five years, but the large Class 4A schools in the Miami area refuse to schedule the powerful Warriors for fear of being embarrassed. That forces Hoffman to search the state for quality opponents such as Hernando and Zephyrhills. Hoffman and Chatman are friends, having coached together for the USA South team in the 1988 U.S. Sports Festival. Chatman contacted Hoffman about playing this year and Chatman also suggested Zephyrhills. Westminster indeed will see two of the North Suncoast's top pitchers this weekend. Hernando will start ace Landon Hessler, who is 1-0 in two starts this season, was 8-0 last year, and is verbally committed to the University of Florida. Zephyrhills will throw Mark Roberts at the Warriors. Roberts has signed with the University of South Florida and led Zephyrhills to the Class 3A, District 9 title last season. "I don't think it would be fair to Westminster to not throw your best," Chatman said. The two aces will face a lineup the likes of which they have never seen. Westminster boasts the player considered by most publications to be the best in the nation, shortstop Alex Rodriguez, who is hitting .569. The Warriors are off to a 6-0 start. One of the victories was over Coconut Creek, rated fourth in the nation by USA Today. The Warriors beat Coconut Creek 11-1 in the championship game of their early bird tournament. "We'll see a lineup filled with Alex Rodriguezes," Milburn said. "They will have more talent from the top to the bottom of their lineup than any team we will face this season. It's a great opportunity for Mark. This will give him an idea of the kind of talent he will face at USF." Westminster has some ace pitchers of its own, including Steve Butler, who was 13-0 last season. He is 3-0 with an 0.50 earned run average this season. Dan Perkins is 2-0 and has not given up an earned run. Westminster attracts Miami's best players because of Hoffman and his program's stellar reputation. Hoffman is 546-162 in 26 years at Westminster and has sent several players into the college and professional ranks. "Most of those losses were early," Hoffman said. "I think the longevity and the stability of the program attracts the best players. We make things fun and exciting and offer a good opportunity for kids to go on to college. "I'd say we have the best players in the Miami area this year. Of course, there is a big talent pool to draw from and there are plenty of good players left over for the other schools." But only one Miami area public school - Coral Gables - offered to play Westminster this season. The teams will meet at the Mark Light Stadium at the University of Miami. Part of the resentment among Miami's public schools is that Westminster is a private school with no attendance boundaries. Hoffman has been accused of recruiting in the past but has never been charged by the Florida High School Activities Association. Lately, the recruiting rumors have died down because it has become obvious that Westminster's success is bringing Miami's top players to the school. "It's not like we drag them kicking and screaming here," Hoffman said. "In fact, a lot of our players who come up through junior high are here from the seventh grade on." Westminster defeated Florida Air Academy 5-1 in last year's Class 2A state championship to culminate a 33-2 season that earned national championship recognition from USA Today and Baseball America. "It was an unbelievable, staggering experience," Hoffman said. "Never in my wildest dreams did I think anything like that would ever happen." Now the national champs are coming to the North Suncoast. Later in the season, Westminster will play in the 16-team Upper Deck Invitational in Anaheim that will include No. 2 Simi Valley, California, and No. 4 Coconut Creek. It's lofty company for Zephyrhills and Hernando. "People ask, `When do you play Westminster? That's the one I'm coming to,' " Chatman said. "I've had scouts calling me all week," Milburn said. "This will be one of the biggest baseball games Zephyrhills has ever seen."